Then go to the technical support forum to ask for help. The CH7307C is a Display Controller device, which accepts digital graphics input signal, encodes and transmits data through a DVI link (DFP can also be supported). The device accepts one channel of RGB data over three pairs of serial data ports. 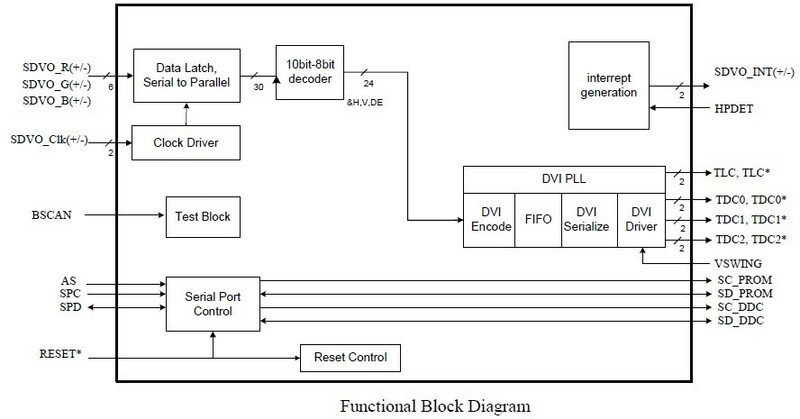 The DVI processor includes a low jitter PLL for generation of the high frequency serialized clock, and all circuitry required encoding, serializing and transmitting the data. The CH7307C is able to drive a DFP display at a pixel rate of up to 165MHz.